Introduction: Parkinson’s Disease (PD) is one of the most common age-related neurodegenerative disorders which is marked with the loss of dopaminergic neurons. 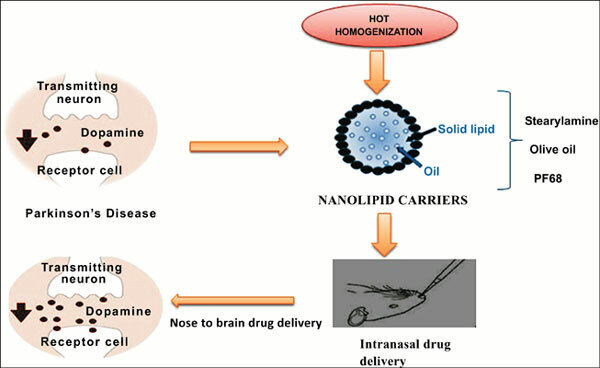 The present study performed on the nose to brain delivery of selegiline hydrochloride loaded nano lipid carrier, suggests that the nasal route is a good mean of targeting the drug directly into the brain. Methods and Materials: Nanostructured lipid carriers were prepared by using hot homogenization. Selegiline hydrochloride loaded NLCs and rotenone treatment were given at a dose of 10 mg/kg administered from 14th day to 28th day. Behavioral parameters were determined at 7th, 14th, 21st and 28th day. On the 28th day, animals were sacrificed for biochemical estimation. Results: The optimized drug loaded NLC formulation has shown 93±5.25% entrapment efficiency and 51.96% loading capacity. Optimized NLCs formulation has shown 70% release within 10 hours and after that, the release of the drug is sustained up to 22 hours (97%). Pharmacological action of the drug was found to restore the behavioral parameters in rotenone-induced rats. Conclusion: Nano Lipid Carrier (NLCs) therapeutics has emerged as a prominent method for the treatment of Parkinson’s Disease (PD) as it offers targeted delivery and enhances the therapeutic efficacy of neurotherapeutics. It is concluded from the studies that, Selegiline HCl loaded nano lipid carrier which was administered through nasal route has the potential to be used in the management therapy of Parkinson’s disease. Nasal delivery, parkinson's disease, rotenone, selegiline HCl, stearylamine, Nano Lipid Carrier (NLC).